Everyone knows the Konami code and to smash it into every website ever, right? But maybe you didn't know that you can stumble into the Tardis on Google Maps. Well, Alltime10s is here to get you up to speed. You're probably aware of a lot of these, especially the gaming-related ones we like to post like the Atari breakout, but hopefully a few are new to you. 10. 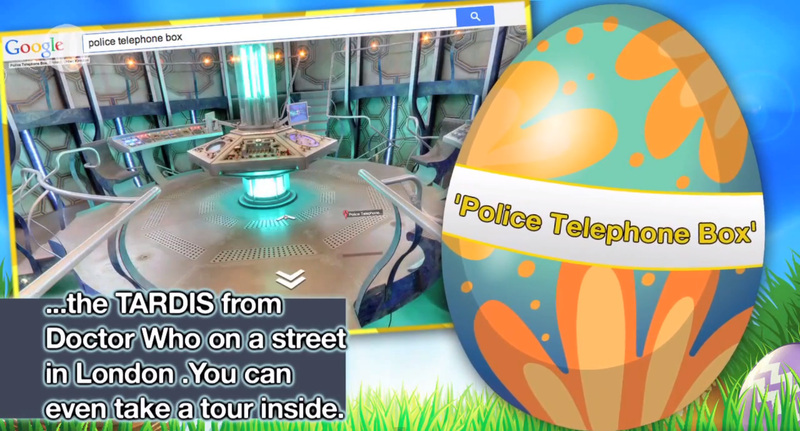 Google Maps: By searching "Police Telephone Box" in Google Maps you'll be able to see the Tardis from Doctor Who on a street in London. You can even take a tour inside. 9. IMDB: As a reference to the famous quote in the film "This Is Spinal Tap," its IMDB page has the review rating of 11 rather than 10. 8. Wikipedia: The "Easter egg (media)" page explains what an easter egg is. You can also see a bunch of them by clicking on the hedgehog in the accompanying picture. 7. Buzzfeed: When you enter the legendary Konami cheat code, Up, Up, Down, Down, Left, Right, Left, Right, B, A, on Buzzfeed the page gets taken over by a Canadian popstar. 6. Vogue & GQ: Enter the Konami cheat code on the websites for Vogue & GQ and you get a very fashionable dinosaur. 5. YouTube: YouTube goes all Jedi when you search "Use the force Luke." You can also try "Beam me up Scotty." 4. Google Images: By typing "Atari Breakout" into Google images you can play the legendary 80s arcade game. 3. Black Acre Brewing: When entering the website for Black Acre Brewing, you're asked if you are the legal age to drink. If you select "I am under 21," you're greeted with...a surprise. 2. Hema: Dutch retailers Hema have a joke product page on their website. Hit the cup & watch what happens. 1. YouTube: On YouTube, click on the right-hand side of a video while it's playing and type "1980." You are challenged to defend the video from a missile attack.